This is the travelog of Michelle and David during their short break to Lanzarote in the Canary Islands. The travelog was written every evening using the Palm m515 and incredible folding keyboard. A flight of almost four hours and Ethan sat on my lap for almost all of it. He is - just like Natasha - a Daddy's boy! A short transfer from the airport. We arrived at Lomo Blanco Apartments in Puerto del Carmen. I was looking after the kids in reception whilst Michelle was booking us in. After a while she called out to say that there was no reservation for us. Michelle isn't that good at catching me out, so I answered “Very good - nice try”. Unfortunately this wasn’t a wind-up. We eventually summoned a rep. from Libra Holidays. After some discussion with the receptionist, the rep came over to tell us that the accommodation we had paid for had not been booked. Just in case you did a double-take, I’ll say that again. We booked a holiday with Libra Holidays, and Libra Holidays took our money and Libra Holidays did not provide the accommodation that we paid Libra Holidays for. The Libra Holidays rep. made a few hasty phone calls and disappeared. We had a snack and drink in the bar. We were then told that we were being moved to Bitacora Lanzarote Club. A cab was ordered. We were told - not by the rep who had disappeared - to pay the taxi driver and keep the receipt. A short while later we arrived at Bitacora Lanzarote Club. We were shown to a twin apartment. The apartment was part underground, looked out on a gravelled area with old bits of piping. To use the main facilities (pool, bar etc.) we had to cross a busy road. The toddler pool was too deep for our toddler. Unlike the accommodation that we booked through Libra Holidays, this accommodation had no oven and no laundry. By now we were very tired. We rang the rep who came to meet us. We explained the problems. I explained our frustration at having spent a lot of time picking and booking the apartment that fitted in with our - mostly the kids - requirements. Yet all this was for nothing. We were not consulted about the alternative accommodation we were just transferred to wherever Libra Holidays deigned that we should go regardless of our views or the facilities that we had booked. We were then told that this was the only twin bedroom accommodation available on Lanzarote because of the Easter break. We held out, all the children were by now asleep on the sofa in the reception area. After refusing to take no for an answer the rep eventually received a call to say that they had found, what we had previously been told didn’t exist, another twin apartment. This time in response to our protestations at being booking into anywhere regardless of our needs, the rep. tried to confirm the facilities were similar to those that we had booked. However, it really was a case of Hobson’s choice. Again we were put into a cab that we had to pay for. Again I had to pay for the cab myself (what if I had not had the good fortune of having some Euros left over from my recent trip to Chinchón?). We arrived at the Flora apartments in the old town. The Flora didn’t have a laundry and had a microwave rather than an oven, but it had a toddlers pool that a toddlers can use, and although were were across the road from the main facilities, this time there was a safe tunnel under the road for the kids to use. The Flora apartments were not what we booked, but they were pleasant enough to see out a week in. It is also a shame that this debacle has lost us a half day of our holiday. Daddy this is the worst holiday ever. We awoke at about 10am too late for breakfast. It was almost two hours later by the time we had finished unpacking and sorting everything out (what a waste we could have done all that yesterday). We ate a poolside bar snack. We were all so hungry that we would have eaten anything. We all had beans on toast with chips, except Michelle who had a salad. I took Ethan back to the room for a snooze and the girls played in the pool. Danielle the rep is a smashing girl, very helpful. I don’t think that yesterday's debacle was handled well at all by Libra Holidays. 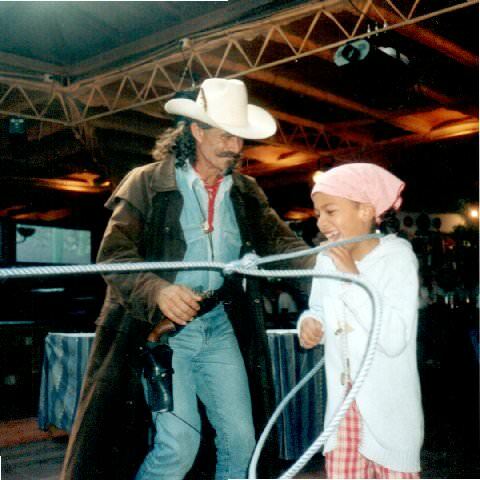 But when she was doing the more routine stuff she was friendly helpful - everything that you hope for in a holiday rep. On her recommendation we decided to book an evening Cowboys and Indian evening for us and the children. We walked into the old town and bought some provisions. We found the Biosfera Plaza. This is lovely. very modern and clean. A sort of mini outside Brent Cross. We ate at a very reasonable place. I hated my selection of tasteless oily food. But everyone else had something different so they were OK. The kids had a go on the kiddie rides, and we sent a few emails from the internet café. I had a look on the BBC news web site to see if Saddam Hussein had been found yet. We took a taxi back. The taxis here are very cheap, and very frequent, why can't the taxis in London be like this? Why is it that they are so expensive that only London tourists and rich city types can afford them and ordinary people end up using unlicensed mini-cabs? A much better day today - mind you it couldn't have been much worse! Today it is a little overcast. Aside for the usual shopping trip for food, we relaxed by the pool. The pool is a little chilly - it is early in the season and the pool is unheated. It has a great paddling pool. It starts very shallow, about two inches and gradually gets deeper. The sides are graduated as well. The shallowest end of the pool is like the source of a river, a small fountain runs into a rock pool which overflows under a bridge and into the paddling pool. This is brilliant for very young toddlers to splash around. We - or at least Michelle and I - had Paella at lunch time. As well as traditional seafood ingredients, they used pork and chicken which is far less appetizing in my view. We left the pool early so that we could get ready for a Cowboys and Indians night. This cost quite a lot of money (£80) for the five of us, but it sounded very child friendly. It was the usual package holiday evening - a venue with some food and booze and some local entertainment. But this time it was a bit more professional than usual. During the night the children were given a tiny horse ride, played with lassos, and were lassoed by a cowboy and played in a tee pee. There was also some face painting, but it was really poor quality. Ethan even got to sit on the Shetland Pony. He liked the pony but was scared of the larger horse. despite this he seemed attracted to the horses as he is to most animals. He calls the horses “Hooby hooby”. We all had a very good time overall. Ethan and Natasha really loved the dancing. After last night’s late finish, we all got up late. A slow start. We finished off all the odds and sods of food that we had left for breakfast. Then we had a walk around the old harbour. Ethan pushed his push chair. He has become really attached to the push chair. Even though he is a really good push chair driver, occasionally it is a little too busy or inappropriate for him to push it around. When we stop him he gets really upset. I have even taken to folding it up and stowing it away in a cupboard when he is asleep. But he soon realises and says “wo chair?” - where is the pushchair? Even though he isn’t quite two, Ethan is a really good boy. He is mostly well behaved and in some ways is really advanced. He is really good at feeding himself - he seemed to bypass the food all over the place stage. He is mostly looking for us, his parents or his sisters “YaYa_” which means Natasha, and “_Le” or recently “Leese”, which both mean Elise. Whilst I am talking about his language, Ethan calls drinking juice "wee”. He calls computers “LaLa” because we have been playing on the Teletubbies website with him. Ethan is also beginning to get into books. He has two that he loves. One with pictures of different vehicles with the noises that the make. His favourite is “Choo choo” and he loves playing with his toy trains and cars. His other book has drawings of underwater scenes and he can spend ages pointing at the fish etc. saying “Daddy dat”, which is my prompt to tell him what it is. Anyway back to Lanzarote! We had lunch in a plush and quite pricey restaurant on the old harbour front called Puerto Bahia. I had French onion soup followed by salmon. It was all very swish. When the girls asked for straws for their drinks the waiter brought them over held between two spoons! The food was very healthy - better than the chips with everything fayre that is on offer in most places. But I could have cooked it better myself and that's not saying much! Also I felt slightly uncomfortable here. Its hard to put my finger on why - I felt that the boss thought that most of the customers, including us, were beneath him. It was polite but not welcoming. Being the computer sado that I am, I was intrigued that the boss used a wireless Compaq iPAQ to take the order. This appeared impressive, until I noticed that all the other staff had little paper notepads secreted away which they used instead of the iPAQ when he wasn't looking! I also heard that Arsenal scraped a 1-0 victory past Sheffield United to reach the FA Cup final. Today is very overcast so Michelle tried unsuccessfully to catch up on her sleep after lunch. I looked after the girls whilst they played with a little girl they met. I think she was Spanish and about 2 years old. We also went for a play in the children's playground. Ethan wasn't that keen because he didn't like the gravel in the park getting in his sandals. Tonight Michelle cooked. It is really great to eat home-made cooking again. She manages to produce wonders with the little equipment and ingredients that we have available. My part of the bargain is to do all the washing up. La Dolce Vita in the old town also is great if you are looking for a nice Italian meal - lasagne was the best! So we gave it a try. I had white fish and prawns in a white sauce with salad and new potatoes. Michelle had King prawns in provincial sauce with rice vegetables. Elise and Natasha had Pizza. Their pizzas were shaped like a rabbits head. My meal was great. The best this week - plain, wholesome and really tasty. The restaurant looked out over the bay and was empty so the kids could run around without us always trying to keep them in check. Very nice indeed. The rest of the day was relaxing so I’ll talk about Lanzarote instead. Lanzarote is on the whole very pleasant and not at all like I’d imagined. The 'strip' in front of the Puerto del Carmen beach is very Blackpool like, lots of tourist bars and restaurants. but there is no tourism rip-offs. The island is not particularly beautiful. It has quite a desolate landscape. However, it is quiet and not overdeveloped. The locals are friendly. Living costs are reasonable and some things are really cheap, e.g. car hire. The weather is pleasant, although apparently it is really unbearable in the height of the summer. There isn't much in the way of culture, so if you want more than sun, restaurants or bars and maybe a bit of walking, I’d look elsewhere. I’d consider coming again, although it wouldn't be top of my revisit list. Today we hired a car. Car hire is cheap. It cost us €65 euros (£45 or $69) to hire a modest car for two days. This included insurance and unlimited mileage. We were promised a 4 door Fiat Punto, power steering. We declined air conditioning because it cost more and the weather isn’t that hot. In the end were given a 2 door Corsa by some sleight of hand. It’s a bit of an old model but it was OK and very cheap. We drove around in a fairly unplanned way. There was nothing in particular to see and the weather wasn't hot enough to stop off at a beach. We had lunch in the town of Teguise which had a colonial feel and cobbled streets. We stopped at Jameous del Agua to see the fantastic surf coming in off the sea. There were quite a few surfers taking advantage of this. Tomorrow we will try the south of the island. The children have met a few others. there is Paoula. She is 27 months and a lovely little girl who has really taken to my girls. She is a couple of rooms down. Her dad is the manager of the complex and they are from Majorca. There room unlike ours is kitted out with video TV etc. unlike ours. The children all enjoyed watching the video Mulan, I think that they are getting TV withdrawal symptoms! Paoula is tiny compared to Ethan who is 23 months - 4 months younger. They have also made friends with a couple of English kids - Louise and Darren. They are about 9 and 7. Ethan and Darren have hit it off despite the wide age difference. Natasha and Elise are friends with Louise, although Elise less so because of the age gap. Strangely Paoula doesn't like Louise and Darren at all. We ate in the hotel restaurant. Elise had rabbit, but we saved her feelings and told her it was chicken. Elise can be quite adventurous with food. She has even taken a liking to curry. The girls had a bit of fun at the kiddies disco, whilst Ethan, Darren and I ran up and down the underground corridor for no particular reason (it's a boy thing - don’t ask why). Oh yes and we have now suffered two days of being without hot water. We drove to the very pleasant resort of Playa Blanca. The place was not a building site, but you could tell that there were planning to expand and develop this beautiful resort, so get there quick! Today we are flying home. We said goodbye to Paoula. Lanzarote is a very pleasant place; not over commercialised and reasonably priced. You can drive around the whole island in a day, and then take another day or two to revisit your favourite sights.